MINNEAPOLIS (Dec. 4, 2017) – Padilla has been named among the Chief Marketer 200 (CM200) in the B2B Demand Gen Agency category. 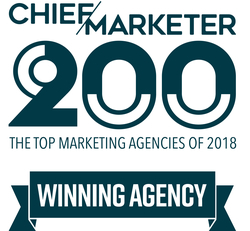 The CM200 is the first and only comprehensive list of the best non-advertising agencies, and features agencies spanning 11 categories, including Experiential, Sports & Entertainment, Promotion and Retail/Shopper, among others. Chief Marketer’s editors accepted submissions from across the country for the CM200 earlier this fall. Winners were selected based on several criteria including: insightful client testimonials; outstanding case study submissions; high caliber, consistent work across programs and clients; innovative and creative executions; and bold and inspiring concepts and ideas that are moving the industry forward. The 200 agencies selected for this year’s inaugural program are thought leaders in their craft and representative of the best of the marketing industry. Early in 2017, Padilla was named a B2B TOP Shop – Chief Marketer’s list of Top 50 B2B marketing agencies. Chief Marketer, with a readership of more than 150,000, provides marketers and CMOs with content, ideas, recognition and events that help them make smarter decisions with their marketing budgets. It offers data-driven industry intelligence, actionable insights, inspiring case studies and the latest technology trends so marketers can improve their campaigns and increase ROI. Learn more about the CM200 and view the complete list at Chief Marketer 200.